Yesterday was meet the teacher (again, still in shock my little mini foodie is big enough to be in SCHOOL - egads! )...so I wanted something quick and tasty for dinner. Hubs and I (and lil Z) all love chicken drumsticks. They are super tasty, always nice and moist, and I love the fact that you can almost always get a wicked sale on them. When I'm feeling less lazy, I skin them, but because of the later start to dinner tonight, I didn't bother. Besides, I (not-so-secretly) love crispy skin. Lil Z loves them too, because they are easy to pick up and eat right off the bone. Another reason I love serving them is that I think it's important for kids to know where their food comes from. I think that kids should know that chicken comes from an actual chicken; drumsticks help illustrate that because I can show Z a picture of a chicken and tell her about what part we're eating. If all you ever serve is boneless, skinless cuts, it's hard for kids to picture what you're actually eating. Whole chicken is even better for this. I digress. One cookbook I can always rely on for quick and relatively healthy recipes is Eat, Shrink and Be Merry. 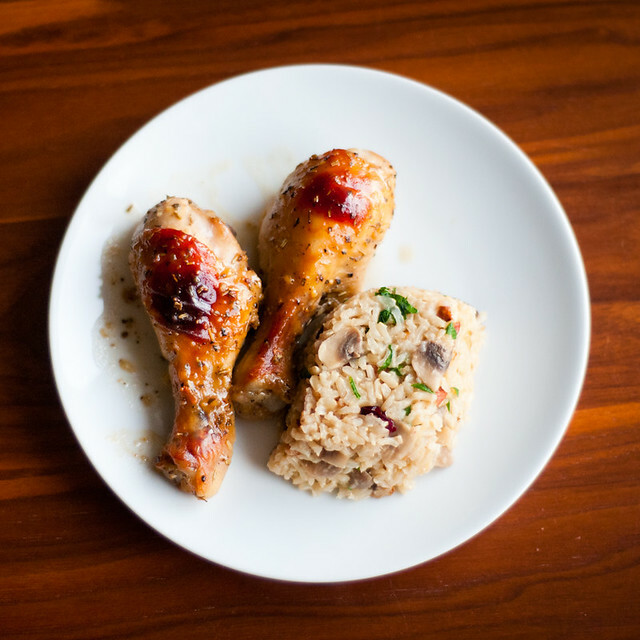 So I opted for a quick honey-mustard chicken drumstick recipe and a brown rice pilaf. Rice is a bit of a picky dish for me; whenever I try to make it on the stovetop, I end up with a hot gluey mess and a burnt pot. I like to start my pilaf on the stove, and finish it in the rice cooker. Works beautifully every time! 1. Preheat oven to 400F. Spray a 9x13 baking dish with cooking spray. 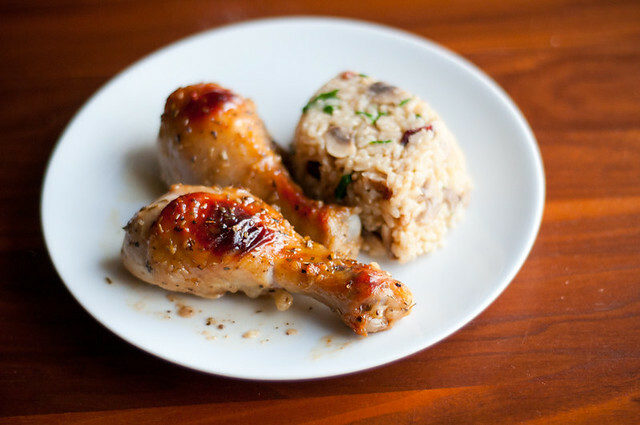 Arrange drumsticks in a single layer, keeping the bone toward the centre, and the meaty parts on the outside (it will cook better this way). 2. Whisk together honey, vinegar, dijon, garlic, herbes de provence and pepper. Pour evenly over chicken pieces. Bake for 20 minutes. Remove pan from oven and baste chicken with sauce. Baste every 10 minutes until chicken has cooked for about 45-50 minutes (use a thermometer to be sure --> 75C). I like to use a standard turkey baster rather than a brush as I find you can build up the glaze a bit better that way. 3. Serve, spooning remaining sauce over chicken. So, once you've got the chicken in the oven, you can start the rice. 1. Heat olive oil in a medium, non-stick pan over medium-high heat. Add mushrooms, onions and garlic. Cook and stir until vegetables begin to soften (3 mins or so). 2. Stir in rice, cook about 1 more minute, until rice is translucent. (at this point, you can add broth and cook in a pot, but I use a rice cooker). Take mushroom/rice mixture and put in a rice cooker. Add broth. Let the rice maker do its magic (it will take about 40 minutes). 3. Once the rice is cooked, stir in cranberries, nuts and parsley. I love reading your new posts! 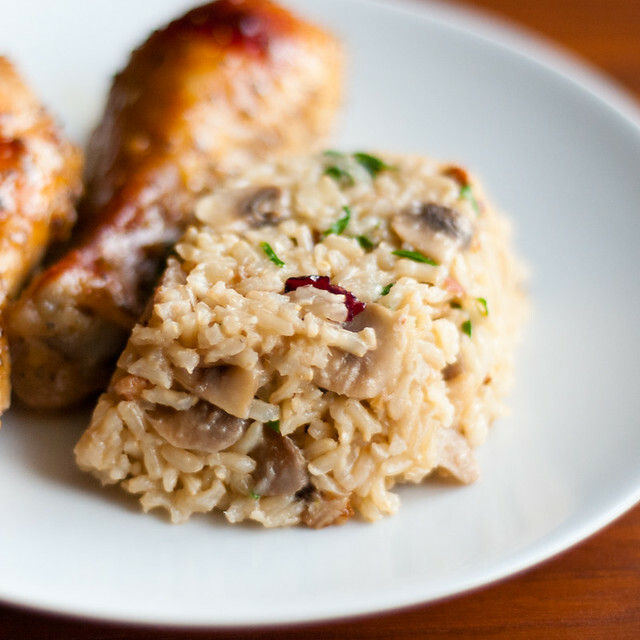 A wonderfully simple meal that everyone will love! Perfect for this fall weather. Thanks for sharing!